Acupuncture points are tiny areas on the skin with concentrated bundles of nerve endings, lymphatics, and blood vessels. The location of these points can be related to major nerves in the body, therefore the needling of a small point can cause an effect in a different area of the body or even to an internal organ. Most points run along what the Chinese call meridians or pathways of energy. How Are the Specific Points Chosen? There are many ways to pick specific points for treatment. One may use the Chinese medical diagnosis to pattern a patient and then pick points to either tonify (increase) or sedate (decrease) the energy in specific organs. Since most points are related to major nerves, another way to decide on a treatment plan would be to pick points that would target specific muscles or organs. Also, often trigger points (sensitive tight muscle areas) are needled to help relax the muscle and relieve pain. How Does Acupuncture Work in Treating Pain and Diseases? Western theory is that local stimulation of the acupuncture points with needles cause localized tissue micro trauma, causing the stimulation of nerves as well as increasing blood circulation. When an acupoint is stimulated the body releases certain neurotransmitters like endorphins (the body’s natural pain killer) and cortisol (anti-inflammatory steroid). The needling of an acupoint causes peripheral nerve stimulation which then affects the central nervous system. How Can Acupuncture Help With Osteoarthritis? Osteoarthritis (degenerative joint disease) causes pain, inflammation, and local stiffness with muscle tension around the joint. This then leads to chronic shortening of the muscles with lower elasticity, causing more joint trauma. Acupuncture causes vasodilatation, which then increases tissue perfusion and muscle relaxation. Cortisol release helps to decrease inflammation. Plus, the neurotransmitters released then help to block pain. There is a high success rate with musculoskeletal problems with acupuncture treatments, especially with arthritis. About 90% of patients with arthritis caused by hip dysplasia usually see a noticeable improvement after just a few treatments. 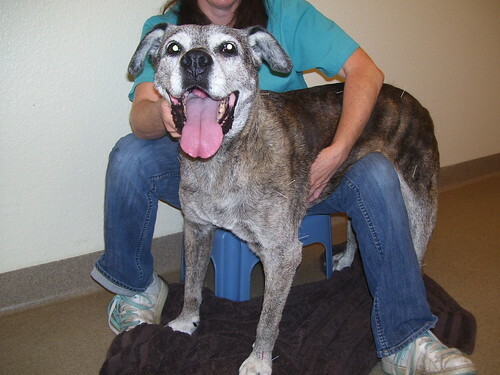 Is Acupuncture Treatment Painful For My Pet? Surprisingly, most patients are very receptive to acupuncture. The needles are very fine, flexible, and extremely sharp, allowing insertion to be virtually painless. Most pets become relaxed or become sleepy after the needles are placed. However, there are always a few patients that may not tolerate the treatments. What Are The Side Effects From Acupuncture? Sometimes the patient’s condition may seem worse for the first 48 hours after treatment. They may become sleepy and less active for 24 hours after the treatment. However, some patients will seem noticeably better right after treatment and become more active. With some animals no notable improvement will be seen until after the fourth treatment. Acupuncture is one of the safest medical treatments available since the patient’s own body is helping to heal itself. Treatment intervals vary depending on the patient’s condition and the method of stimulation used by the veterinary acupuncturist. Most patients start out with once or twice a week treatments for four to six weeks. Once a response is seen, then the amount of time between acupuncture treatments may be tapered to a maintenance schedule. 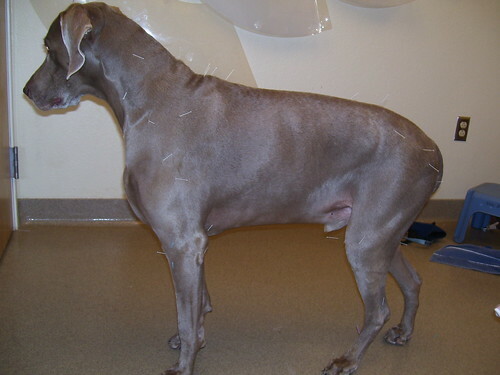 Make sure your veterinarian has had formal training in practicing acupuncture for animals. If your veterinarian does not offer acupuncture care, ask them to refer you to a trained veterinary acupuncturist. The IVAS (International Veterinary Acupuncture Society) and the AAVA (American Academy of Veterinary Acupuncture) both have websites with veterinarians in your area that are trained in acupuncture. As a veterinarian, I am always seeking ways to improve the well being and health of my patients. If I can make them more functional and comfortable, then I have succeeded in my care. 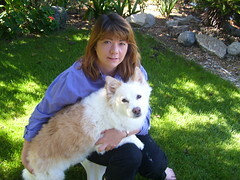 My interest in veterinary acupuncture began after becoming a certified animal chiropractor. After finding one alternative medical care that helped my patients, I decided I should study veterinary acupuncture. Acupuncture is often recommended prior to chiropractic adjustments to help relax muscles, decrease inflammation and pain allowing the adjustments to hold longer. If you’d like to schedule an acupuncture or chiropractic consultation with Dr. Michele Greer, she can be reached at ( 760) 583-1410. She sees pets at the Adobe Animal Hospital in Ramona, Calif. She also makes housecalls, and a location in Oceanside is planned. Love your well written article. 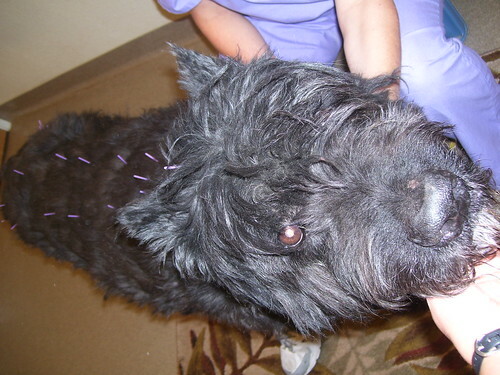 We have seen first hand the wonderful benefits of acupuncture on dogs. Thanks for sharing this. Nice blog too. What about a dog with nerve involvement on one side of his face?Extensive testing at cornell hospital as of now with a few pending results has turned up nothing.The results are not back yet for myasthenia gravis(focal not general)is what they seem to be leaning towards but so far the diagnosis is ideopathic.Do you think acupuncture and/or chiropractics can help him?